Rugs are more than just floor accessories. Depending on their materials, thickness, and textures, rugs can create a certain atmosphere in a room. There are various types of rugs available at furniture stores, and they are group based on materials, placements, construction methods, and patterns. Are you trying to find the best rug material and type? Find your shopping inspiration from this list. From wool to synthetic, various rug materials have unique characteristics. Adjust the materials with the conditions of your house or rooms. Wool is a popular material for rugs. It provides good insulation, comfort, and strength. Adorning room with low feet traffic is perfect. However, wool absorbs moisture quickly, not ideal for a house with many kids or pets. Cotton is cheaper and thinner than wool, perfect for the more casual room. Cleaning is easier for this rug, but it does not last long. Cotton is the best for rooms such as kitchen and kid’s playroom. Synthetic materials, such as polyester and nylon, is perfect in any room with a high risk of spilling or staining. Synthetic materials are ideal for houses with pets and kids. Many manufacturers now can make synthetic materials that mimic other rug texture, like wool and natural plant fiber. Rugs from woven grasses (or grass-like fibers) are usually thin, rough, and looking more “rustic” than luxurious. This rug type is popular in tropical regions because it feels lighter and cooler. These materials are also durable and renewable. However, woven grasses may feel too rough for some. Silk is one of the most expensive materials for a rug. Silk rug feels soft, has a beautiful sheen, and perfect as decorations. It is suitable for a low-traffic room. Silk rug requires special cleaning technique to keep the material intact. This material is often used to make the intricate oriental rugs. People nowadays don’t just play any rugs in different rooms. Many rugs are created to fit specific purposes in different rooms. Area rugs are the most popular types based on placements. These rugs are available in numerous colors, sizes, and patterns. They may cover the entire floor or only a section, dividing a large room into several areas. Outdoor rugs are designed to withstand natural elements, such as heat, cold, water splashes, and wind. They are also easier to clean. They are placed on patios, decks, and terraces. Also called “stair runners”, these rugs often have a non-slip base. They are designed to decorate stairs and reduce slipping risk. The designs are very long and thin (for easier layering), and the widths can be adjusted with the actual stairs. Bathroom rugs are often placed near shower stall or bathtub. They reduce slipping risk and absorb moisture from the feet before you step out of the bathroom. Bathroom rugs are also ideal for decorating areas around vanity desks. Kitchen rugs usually have shorter fibers, with non-slip base. They are designed to reduce slipping risks and protect the floor from drips. Kitchen rugs are often placed near the stove or sink. Different construction styles create unique textures and appearances. They also determine the durability of the rugs. Tufted is one of the cheapest rug styles because the fibers are simply looped through the base. It results in cheap, textured, padded, but a short-lasting rug. This method is often used to make area rugs. Braided rugs are created by looping several sections of long cloth. This is a traditional American method that results in oval or round rugs. Knotted rugs are made by creating small knots before cutting the rest. Hands or machine can do this method. A popular example is a Persian rug, which can take about one year to create using the traditional method. The flat-woven rug is made by using continuous knotting actions (without cutting). The result is unique texture similar to traditional Indian and African rugs. The construction is faster, making it cheaper than a knotted rug. The hooked rug is created by looping the fibers through previously-made holes on the base surface. This method creates “squares”, where individual patterns can be created. Hooked rugs usually have short fibers, especially if they have multicolor patterns. Manufacturer weaves rugs in unique patterns and shapes, but individual rug makers also have their unique ways to create carpets. These different methods create unique styles that you can match with your home design. Traditional rugs may differ depending on the origins of the designs. However, these rugs usually have complicated motifs, such as flowers, vines, batik patterns, or medallions. They are often opulent and sophisticated. 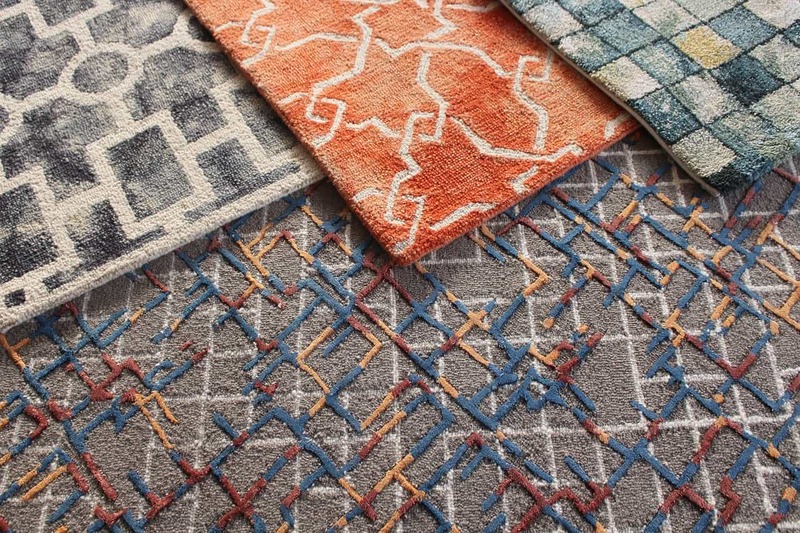 Modern-style rugs have diverse patterns that show stark contrast from traditional motifs. Many of the designs are free-form or have geometric patterns. The styles are often simpler than traditional motifs. Industrial rugs refer to carpets used in work or industry settings. They are usually simple and easy to match with various room styles. These rugs are durable, easy to clean, non-slippery, and have economic prices. Scandinavian rugs have lighter colors, materials, and patterns. Their typical patterns are simple shapes, like squares and lines with wide spaces. The colors often consist of white, light grey, light brown, and beige. Both coastal and tropical bring specific natural vibes to the house. Coastal rugs usually have sea and sand colors or motifs. Tropical rugs have more forest “vibe”, with patterns such as large leaves and flowers. They are often made of natural fibers, such as rattan, sisal, and jute. 5. Which Rug Types Do You Need? Choosing rugs requires attention to your house characteristics. If your house has many occupants, with pets and kids, stay away from materials that are hard to clean. Wool and silk are a no-no, except if you want to place them in your private bedroom. Match your rug types with the dominant colors and styles of your home. Tropical rugs are perfect to brighten a modern room. Silk rugs with warm colors look great in a Mediterranean dining room. These types of rugs have unique characteristics that will match any houses or offices if you choose correctly.